What is is that they say about the children in Lake Wobegon? “… where all the children are above average.” Of course, when every child is special then no child is special, and that’s the way it is supposed to be. At this past weekend’s CRUSY kinnus at Beth El in Pittsburgh, every child was warmly received and brought into the program. There were no special needs. There was only a conscious effort to provide everything that was needed to make the program fully inclusive and accessible. This post is my periodic plea to congregations to consider what it takes to be accessible to a blind person who happens to walk through your door on Shabbat. It doesn’t take much. This year, Beth El’s inclusion committee decided to purchase a set of the Braille volumes of Sim Shalom and Torah. They actually only needed to acquire five of the nine volumes of the siddur in order to satisfy the needs of a regular Kabbalat Shabbat, Shaharit, Minha, and weekday morning. Knowing that they were hosting the kinnus, they also purchased the volume of Torah and the haftarah for that specific Shabbat. All of this is easily available from the Jewish Braille Institute. When my son Solomon arrived at kinnus, he was not special. He dovened just like everybody else, with his Braille siddur. He went up to the Bima and led Torah service. It was no big deal. He just participated in leading a part of the service, something that a couple dozen USY’ers did over the course of the weekend. However, it was a big deal to his father who was standing in the back of the sanctuary with tears running down his cheeks, because at that moment his son was not special. Like thousands of youth before him, he was given the honor and privilege of participating in a Shabbat with his USY friends. One day, Solomon might show up at your synagogue. When he does, are you going to make him feel ‘special’ by requiring him to bring his own very bulky set of books, or are you going to make him feel like a part of the congregation by giving him a book, just as you will undoubtedly do for every other person who walks in? For more detailed information on how to order a standard Shabbat set of Braille volumes, contact me at Rabbi@AhavasIsraelGR.org. How well do I see beyond the quirky jerky movements, beyond the wheels on the chair, beyond the blind eyes or augmented ears or impaired speech? Do I fall into the trap of seeing people with disabilities as superhuman just because they live with disabilities? Am I seeing impaired humanity rather than embodying the love and wisdom of believing that the face of God is visible within every human being, learning how to look beneath the physical shell of the individual and find the sparks of unique holiness? Jacob Artson is a powerful communicator, a talented writer. Jacob Artson has autism. We should not be surprised that these two sentences are mutually inclusive, not exclusive. My name is Jacob Artson and I am a person just like you. I am part of a wonderful Jewish family, I go to our local public high school where I am in regular English and social studies classes, I play sports, I love to travel, I enjoy hanging out with my friends, and I care about making this world a better place. The only difference between you and me is that I have lots of labels attached to me, like nonverbal, severely autistic, and developmentally disabled. It is true that I have many challenges, but there are lots of myths and misconceptions about autism out there. Many purported experts claim that people with autism are not interested in socializing. This is totally ridiculous. I love people, but my movement disorder constantly interferes with my efforts to interact. I cannot start and stop and switch my thinking or emotions or actions at the right time. This can make being in a big group very lonely and that is the worst thing about autism. So next time you see someone like me at your synagogue or at your event, remember that they probably feel really lonely and you could be the person to make their day by smiling at them and letting them know that you know they exist. Another myth is that the majority of people with autism are mentally retarded. In fact, our bodies are totally disorganized but our cognitive skills are intact and our minds are hungry for knowledge. Every person alive is encumbered by challenges and blessed with gifts. I used to think that my ratio of challenges to gifts was higher than most people’s, but now I realize that my challenges are just more obvious. I have learned that autism can have its advantages. For example, I get a VIP pass at Disneyland and I get to kiss all the beautiful counselors at camp and pretend I don’t know any better. On a serious note, not being able to speak means that you spend lots of time listening. In fact, much of what I know I’ve learned from listening to conversations that other people didn’t think I could hear, or listening through the wall to what the teacher in the next classroom was saying. People often ask me how I became such a good writer. The answer is that my inability to speak gives me lots of time to contemplate and imagine, and it also forces me to hear everyone’s perspective and think about it because I cannot interrupt or monopolize the conversation like people who have oral speech. In the autism world we say that not being able to speak doesn’t mean that you don’t have anything to say. In my experience, the converse is also true – just because you can speak doesn’t mean that you have anything worth saying. Since I have been asked to write about including people with disabilities in the Jewish community, I want to share with you the ways in which autism has affected my participation in Jewish life. My family has been my greatest support from the day I was diagnosed. My amazing twin sister Shira is my best friend, hero, chief source of entertainment, and fashion consultant. My ema (mother) is my rock and has never let autism be an excuse for failure. My abba (father) has been my spiritual guide and is also really fun to be with. Even though I know they love me, they have carried a tremendous burden and I always feel guilty about that. Unfortunately, the Jewish community has not always helped ease their burden or mine and often has exacerbated it. I have found great support in God and Torah. Our people’s wisdom has helped me through difficult times and guided me as I strive to become a productive member of society. My bar mitzvah was special because everyone there accepted and celebrated me for exactly who I am. I wrote a siddur commentary and everyone in attendance took turns leading the prayers and reading my words. At the end of the service, everyone came up on the bimah for Adon Olam. I will carry in my mind and heart forever the picture of everyone there smiling at me. I had wonderful experiences when I was in a Jewish preschool and later in kindergarten, even though my teachers had never had a child with autism in their class. What made those experiences successful was the way the teachers modeled inclusion for the other kids. They treated me as a person made in God’s image and not as different in any way. In kindergarten, I had amazing peers. They were mostly Persian and inclusiveness is engrained in their culture. They tried all year to get me to interact with them even though I was usually too excited to focus. I’ve also had wonderful buddies from the Friendship Circle, attended several Jewish camps, participated in a Jewish musical theater program called the Miracle Project, and prayed at Koleinu, a service at Temple Beth Am for kids with special needs. But there have been obstacles as well. Believe it or not, there is a hierarchy even within programs for kids with special needs. Because many Jewish programs in my community are geared for so-called “higher functioning” children, the first reaction is often that I am too disabled to attend. So whether I’m invited seems to depend on the particular director that year or whether my parents decide to complain and fight for me to participate. Most of these programs could easily accommodate people like me with a little attitude adjustment. My family’s efforts to include me in synagogue life have also been a source of great stress. When I was younger I went to synagogue every Shabbat, but the other kids ignored me. My synagogue started a Shabbat morning service for kids with special needs and that gave us a community of sorts, but now I am a teenager and need to find my own place. 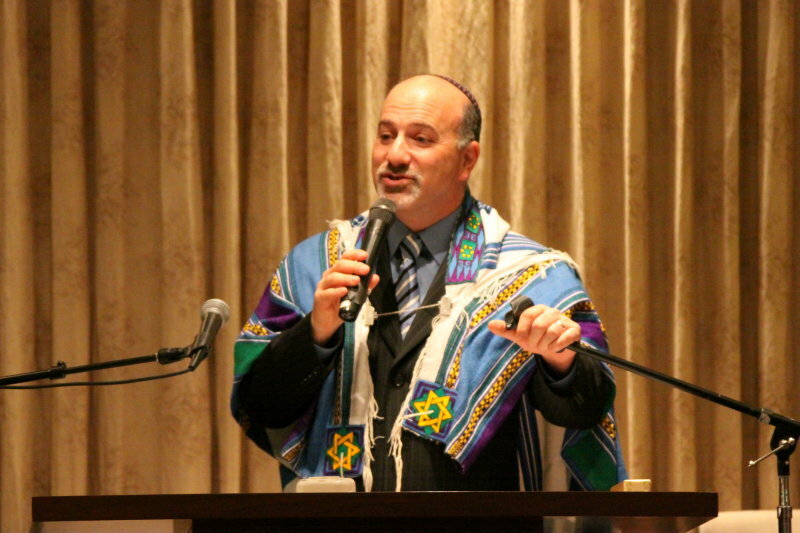 I was invited to speak at Ikar, a small synagogue in our community, where I was welcomed just like any other member. I was not given icy stares when I got too excited, so my family joined. The kids there say hi to me even when they are not getting community service credit for interacting with me. The public schools and secular programs I have attended have been much more welcoming and are built on a model of mutual respect rather than pity. The Los Angeles public schools are overwhelmingly black and Hispanic, and they too seem to have a culture of inclusion. The kids at school treat me like family and pull me into everything they do. I go to a secular camp for autistic kids in Aspen every summer and everyone is welcome there. We do cool things like go tubing and kayaking and I am able to participate in everything because I know they will work with me where I’m at. In my secular inclusive sports program, Team Prime Time, the director has taken the time to allow for sharing on several levels, so the kids all respect me for my intelligence and understand how hard I’m working to make a basket or kick the ball. I have also been part of their new volunteer training and have spoken about autism at school, but I have never been invited to participate in volunteer training for any Jewish program I have attended. So here is a final thought I would like to leave you with. The best peers and aides I have had didn’t have any special background. It doesn’t actually take any training to be a leader who models inclusion. It just takes an attitude that all people are made in God’s image and it is our job to find the part of God hidden in each person. I used to get very upset and offended at the idea of being someone’s mitzvah project or community service project. But now I see that I also have a role to play in helping create the messianic future. It is easy in our affluent society to become dazzled by the material opportunities and privileges that we have been born with. But I have had to struggle from the day I was born to do many things that other people take for granted. Because of that, I have experienced God’s love in a way most children have not. So maybe we are each other’s mitzvah project because I can help them see the glories of the world that they have never noticed, and they can teach me how to look like other kids. All in all, who is getting a greater benefit? In the end, together we bring God’s glory to all of humanity. Jacob Artson, 17, is a student at Hamilton High School in Los Angeles. He hopes to become a writer and teacher.